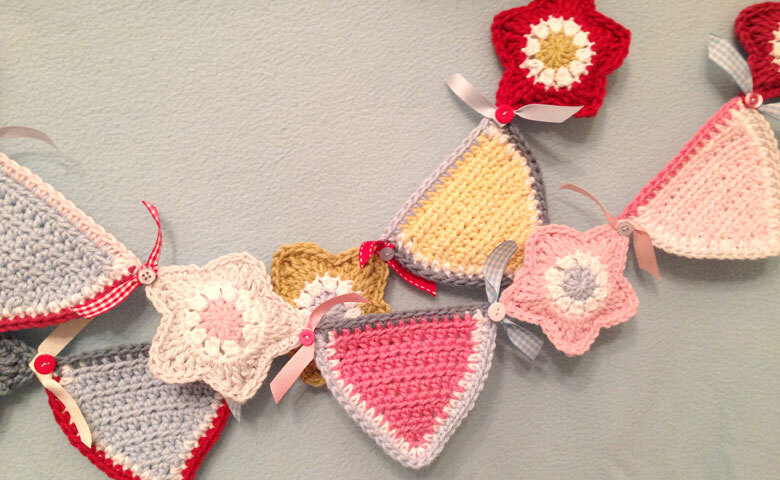 This is a tutorial to create some crochet star mini bunting. 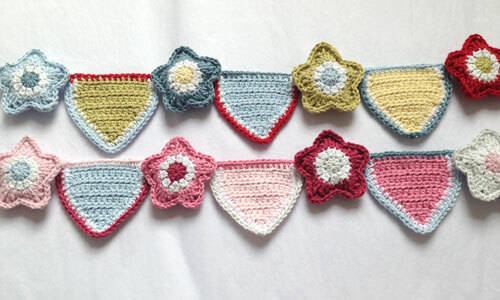 It is created using two other free Ruby and Custard patterns – mini crochet bunting and the easy crochet star alongside a bog dollop of creativity and some fun! 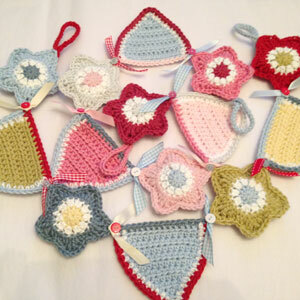 You need DK wool, a selection of ribbons and buttons and a 4mm crochet hook. 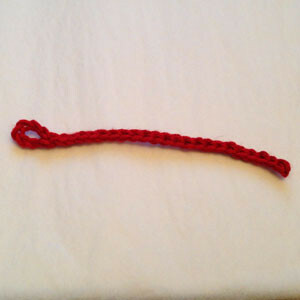 Step 1 – Make enough pennants and 2 stars for each link to be long enough for your string. 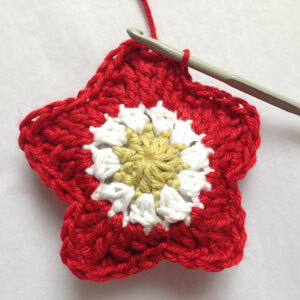 Step 2 – Put the 2 stars wrong sides together and insert your hook through both outside stitches of the stars. 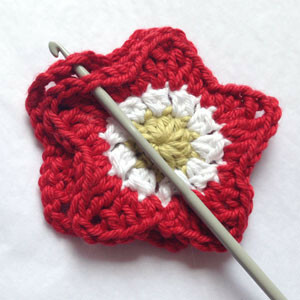 Step 3 – sc through all 4 stitches of the outside edges of the 2 stars until you reach a ‘point’ where you will need to do 2 sc in the same stitch to turn the corner, and the bottom of each triangle in the bit between each point where you will need to do a slip stitch to ease around the dip. 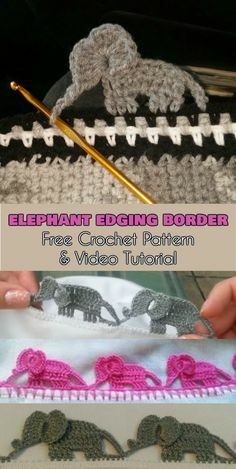 Work along the whole edge following this method, until you have a small gap left. Stuff a very small amount of stuffing carefully in to give the star a bit of stiffness but not enough to make it overly puffy. * Continue working until you reach the end and fasten off. * I use the stuffing of cushions from IKEA as they are all treated for fire resistance etc and I find it cheaper than toy stuffing. 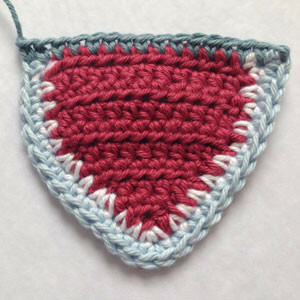 As you are not joining all of the bunting pennants together you need to add a top to each pennant to give them a tidy finish. 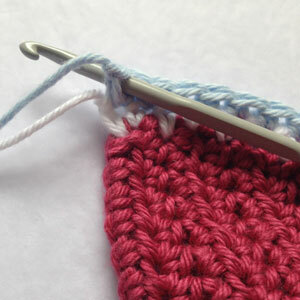 Step 1 – insert your hook into the top right hand corner of a pennant and sc into the first hole. 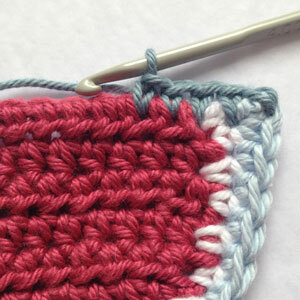 Step 3 – Continue sc along the top of the pennant until the end. Fasten off. This should give your pennant a nice, tidy top. You can now assemble the body of your bunting. 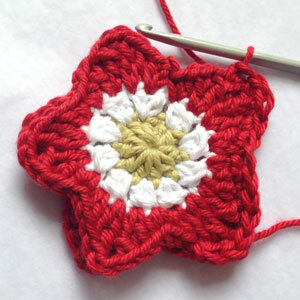 Stitch each pennant to a corner of a star with coordinating wool. 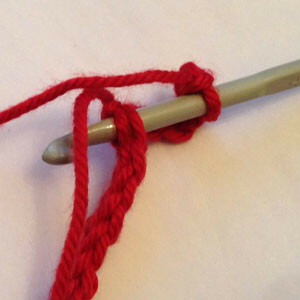 You need to make a hanging loop for each end of your bunting string. My bunting has been designed to hang on the end of a bed and needs to loop through the bar so I have made my loops attach with a button. Step 2 – turn and slip stitch into each chain, working back along your chain until the start. 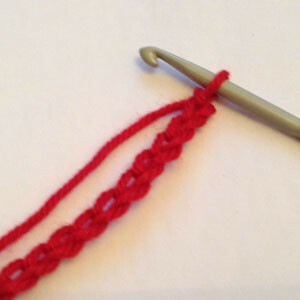 Step 3 – make an additional 5 chains and insert your hook into the first stitch on the slip stitch stem to form a loop. 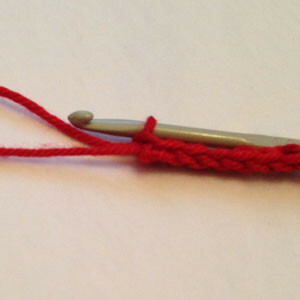 Step 5 – attach the end of the stem without the loop to the back point of an end star. 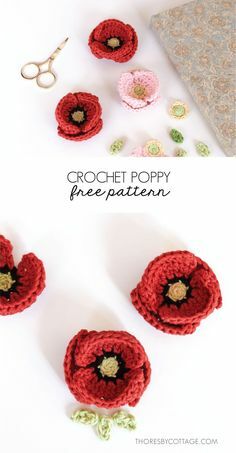 Sew a button on top of the stem base. You can now decorate your bunting. 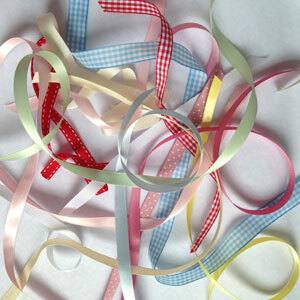 Choose a selection of ribbons and cut some short lengths of ribbon to place between each star and pennant. 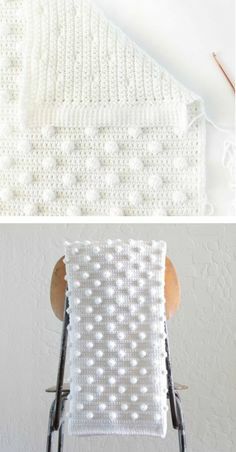 Put a loose tie in each piece of ribbon and attach it to the space between each star and pennant and sew a button on top. You should now have created some beautiful star crochet bunting! Enjoy! 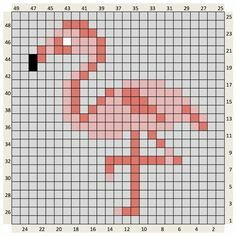 If you make something from this pattern I would love to see it! 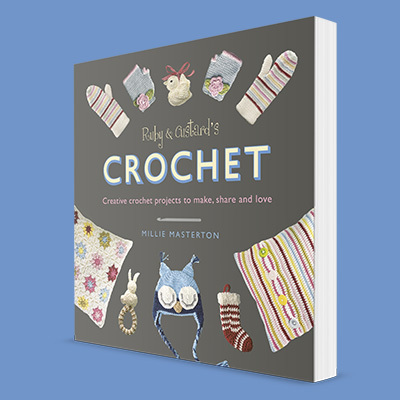 Please send any photos to millie@rubyandcustard.com. 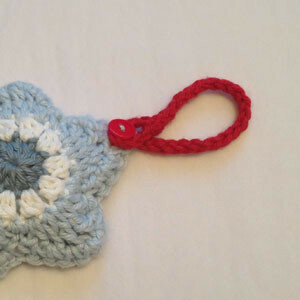 Small print: this pattern has been published in good faith for personal use only. You may not use it for commercial gain including selling items made using it or by selling the pattern. 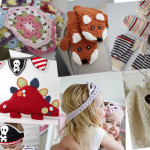 If you would like to make items for charity from this pattern please contact me at millie@rubyandcustard.com. Thank you!